The key factor for the prosperity of the Cathedral City and its direct environment has always been its central location in Europe. Cologne is situated at the heart of the central region within the European Economic Community. With a population of 105 million and a radius of 600 km, this central region is bordered by the cities of Paris, London, Hamburg, and Stuttgart. This is where over 40% of the EU's gross domestic product is produced. For more than two millennia, Cologne has been the trade centre at the heart of Europe. As a result the infrastructure located here offers the best conditions for the biggest cultural, political and economic events. Cologne is the oldest German city. The name Cologne stems from Agrippina, the Cologne-born wife of the Roman Emperor Claudius, who proclaimed her "Colonia" on the banks of the Rhine a city in the year 50 AD. The Romans have left their mark everywhere in Cologne, traces of which are encountered at every turn: from the first city wall and the city's first water pipe to the Cologne link to the Roman Empire's road network. A section of this road is now called Hohe Strasse and, two thousand years later, it is still the best-known shopping street in Cologne. As early as the late antiquity the Romans introduced Christianity to Cologne. Cologne became a diocese - in 785 Charlemagne founded the Archbishopric of Cologne. The Archbishop of Cologne, one of the most powerful feudal lords in the Holy Roman Empire, became the Chancellor of Italy (in the eleventh century) and an Electoral Prince (in the fourteenth century). Some of the major architectural landmarks, which originated under the influence of the Archbishop, are the twelve major Roman collegiate and monastery and convent churches in the city and, obviously, the world-famous cathedral. In the Middle Ages Cologne experienced another heyday. Up until the fifteenth century the cathedral city was one of the most populous and affluent towns in the German-speaking area. As early as the thirteenth century the Cologne citizenry had assumed control of political and economic power. In 1388 the first municipal university in Europe was founded in the city, and in 1475 it was finally granted the status of a Free City. As early as this period Cologne played a major role as a leading Hanseatic city and trade fair centre. Some of the still-extant remnants of this period are the Overstolzenhaus, a magnificent Roman town house, the Gothic Town Hall and the Gürzenich, a venue of the 1999 dual summit, where emperors and kings were feted as long as five hundred years ago. Cologne experienced a further boom in the nineteenth century during the industrial revolution, the opportunities of which the city had recognized at an early point in time. Although the First World War checked this development, it was not interrupted. The city suffered far more seriously from the consequences of the National Socialist tyranny. From 1937 onwards the cathedral city also witnessed racial persecution: four synagogues were destroyed and numerous Jews, Gypsies and dissidents fell victim to the inhuman system. The bombing raids during the Second World War also had a devastating effect on Cologne. In 1945 90% of the entire city centre was completely destroyed and the population had fallen from the previous total of 800,000 to just 40,000. However, the population of Cologne did not despair and the worst of the war damage was soon eliminated - reconstruction began: an underground railway, new roads, industrial companies, the Rhine tunnel, office and shopping complexes, numerous new districts and the redesigned inner Cologne ring roads bear testimony to the dynamic development which Cologne has experienced during the period from 1945 until today. The impressive museum complex on the banks of the Rhine, the MediaPark and the Kölnarena are new landmarks on the cathedral city's skyline, the skyline of a vivacious, cosmopolitan city boasting a long tradition and a marvellous future. having been the city's focal point and quality standard for more than 750 years, it is not just the architectural heart of the Rhine metropolis. The largest cathedral in Germany also houses cultural and historical treasures or immeasurable value, such as the Sarcophagus of Epiphany (dating from the thirteenth century), the final resting place of the Holy Epiphany, whose scale and splendour put all comparable golden sarcophagi of the East in the shade. Cologne is a city of churches. As in no other German city twelve large Roman collegiate and monastery and convent churches are located in the confined area within the course of the mediaeval city wall, churches that rank among the most important in Western Europe. Alongside the bishop's church, no other German city has as many seminaries, cloisters and other religious structures as Cologne. Between 1150 and 1250 nearly all of the churches were rebuilt. Even today twelve excellent examples of Romanesque basilicas remain, some of which are among the best of their time. Along with St. Maria in Capitol, which is oneSt. Maria Capitol of the most innovative Romanesque constructions, it is the large churches of the Late Romanesque period, which stand out. Their unmistakable design places them in a stylistic group all their own. In spite of extensive wartime damage and reconstruction work which was not always true to the original, Cologne is today able to boast Germany's most important ensemble of Romanesque architecture in Germany. Innumerable other cultural monuments are also located within the shadow of the cathedral, such as the mediaeval Overstolzenhaus, the Gürzenich and also the famous Roman Dionysos Mosaic over which the Römisch-Germanisches Museum was constructed. 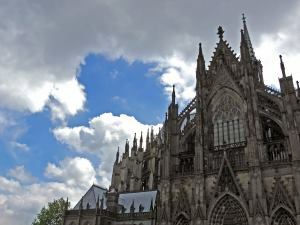 This is one of the eight municipal and numerous ecclesiastical and private museums in the cathedral city which have established Cologne's leading position among the international art and cultural metropolises. The most well-known is undoubtedly the Ludwig Museum boasting works from the classical modern age and American pop art to the most modern trends of the present - together with the Wallraf-Richartz Museum it is housed in the spectacular new building between the cathedral and the Rhine with the philharmonic's underground concert hall - and, last but not least, the private Imhoff-Stollwerck chocolate museum located in the Rheinauhafen which boasts everything which there is worth knowing and tasting from the history of chocolate. In Cologne there are more than 100 galleries displaying the entire range of the worldwide art trade. It is here, as at the Art Cologne, the international art fair which is staged annually at the Cologne trade fair site, where what will be on display in the museums of the world tomorrow can be viewed and acquired today. The last decade of Cologne's varied cultural life has also been characterized by the city's additional rise as a music metropolis. What is particularly fascinating is that all styles of music from all eras can be heard in the city every day,at the marvellous philharmonic in the Domhügel, a concert hall of international rank, for example, or in the spacious, modern opera house boasting a repertoire encompassing classical and romantic opera, at the innumerable live music spots, such as the Stadtgarten or the Subway, at the E-Werk, in the live music hall or at the new KölnArena, Germany's largest entertainment and music hall.at the marvellous philharmonic in the Domhügel, a concert hall of international rank, for example, or in the spacious, modern opera house boasting a repertoire encompassing classical and romantic opera, at the innumerable live music spots, such as the Stadtgarten or the Subway, at the E-Werk, in the live music hall or at the new KölnArena, Germany's largest entertainment and music hall. Urban repertoire theatre is performed at the Cologne Theatre, the Halle Kalk and the Schlosserei. Numerous private theatres supplement the theatre scene . A classic among these private theatres is the "Volkstheater Millowitsch", which has been a Cologne institution since 1848. The curtains are also raised for cabaret and theatre at the "Senftöpfchen", the "Der Keller" theatre, the "Im Bauturm", the "Freie Kammerspiele", the "Comedia Colonia", the brash "Kaiserhof" and at dozens of other theatres in Cologne evening for evening, including for almost the last two hundred years at the Hännesches Theater, a puppet show dating from as far back as 1802, which succeeds in entertaining its audiences primarily with humour and scripts in the local Kölsch dialect of German. There is always something happening in Cologne: innumerable national and international sporting events, world and EuropeanMedia Park championships and open-air festivals featuring world-famous stars at the Müngersdorf Stadium or in Roncalli-Platz adjacent to the cathedral, major sporting and cultural events at the KölnArena, trade fairs, congresses and political and economic conferences, such as the 1999 dual summit - all these events attract millions of visitors to the cathedral city every year. The music festival along the inner ring road, one of the largest music festivals anywhere, during PopKomm, the largest pop music trade fair in the world, is just ten years old. On the stages erected along the inner ring road between Rudolfplatz and MediaPark, in innumerable halls and clubs and at innumerable open-air festivals hundreds of top music acts and newcomers attract more than two million music enthusiasts to Cologne every year. The atmosphere during the last few weeks of the year is somewhat more tranquil: Cologne city centre becomes engulfed by pre-Christmas charm when the four large Christmas Fairs are opened during the last week of November: adjacent to the cathedral, in the old and new market squares and at Rudolfplatz. Craft items, toys, Christmas tree decorations and delicious delicacies are on offer while Christmas music is played in the background. It is not only children's eyes which shine when pewterers, wreath makers, glassblowers demonstrate their talents and the aroma of "glühwein", hot sweet chestnuts and gingerbread pervades the city centre. Another spectacular occasion, but one which is considerably older than the inner ring road music festival: the world famous Cologne Carnival a jovial, colourful public festival, which the inhabitants of Cologne themselves have christened the "fifth season". Carnival allows everyone to poke fun at the world for once and particularly at him or her. Almost four hundred carnival sessions and balls between New Year's Eve and Ash Wednesday provide ample opportunity for them to do so. The street carnival is opened at 11.11 a.m. in the old market square on "Weiberfastnacht", the Thursday which precedes the main Carnival Monday procession and the day on which the ladies assume control. The alcohol curfew is suspended and young and old, natives of Cologne and non-natives a like, celebrate their all-day carnival festival in fancy dress in the city squares and streets, offices and homes, and particularly in the city's pubs and halls. The carnival season comes to a climax the day after the colourful school and local community processions which characterize Carnival Sunday: the kilometre-long triumphant procession of the "Cologne Triumvirate" - the Prince, the Peasant and the Virgin - through the city centre. Innumerable decorated carriages, life-size figures and bands, hundreds of horses and the colourful rank and file carnival enthusiasts put millions of spectators along the procession route in the right mood. The carnival participants distribute tons of sweets and bunch of flowers among the onlookers.